Sunrise pierces a gap in the curtains and delivers a dose of reality from all-too-brief slumber. We have to go. 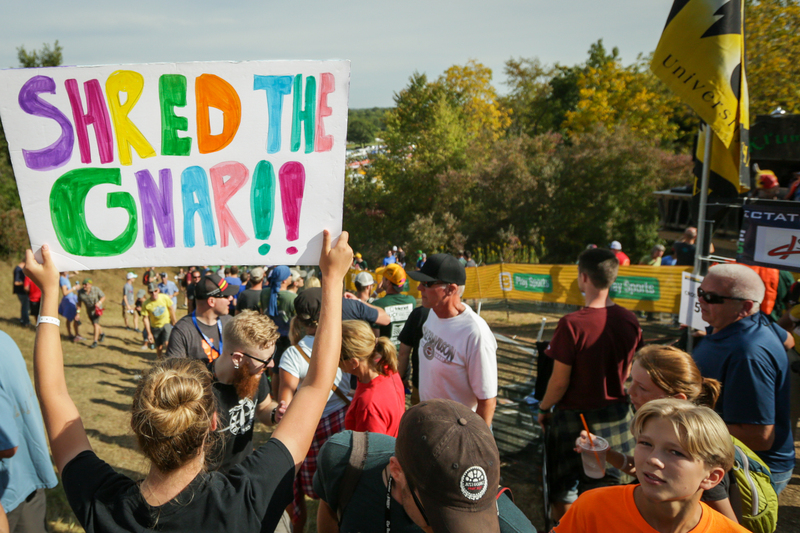 It’s World Cup Sunday at Jingle Cross. It’s a bit of an adjustment following two days of night races. 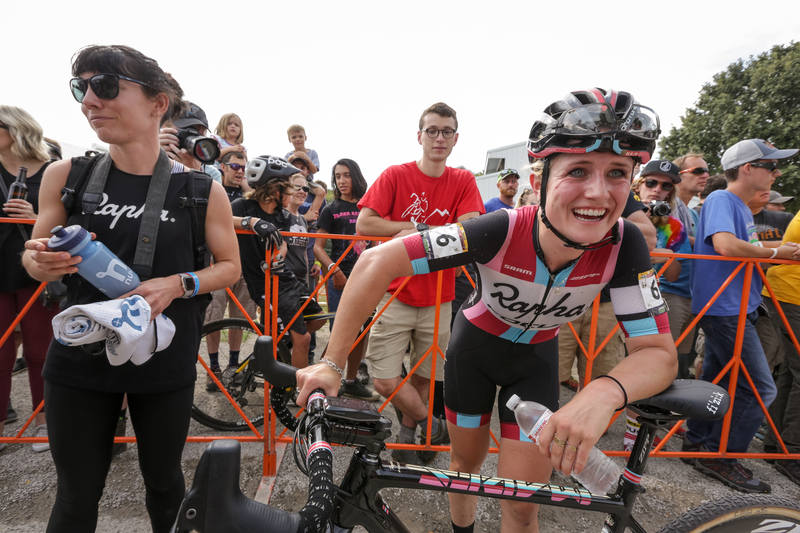 After winners left the podium, media got started with the work of filing reports and filling social media feeds before clocking out at 4 a.m.
It’s an adjustment for riders, too. Amped after race efforts, they struggle to sleep. Schedules are off. For that reason, some racers chose to skip the night races, including current World Champions Sanne Cant and Wout van Aert. 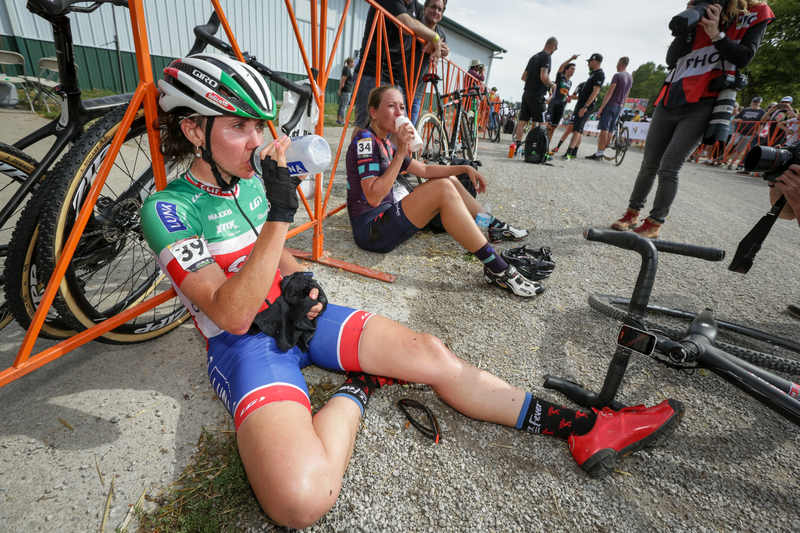 Others raced for UCI points, payouts or maybe just a hard effort. If nothing else, night racers got plenty of practice laps to dial in their lines and their gear for Sunday. But there’s still much to learn about the World Cup course. Several sections were not included in the night race routes or the amateur circuits from the previous days. Bill and I need to get to the venue. We need to get in our practice laps too—we need to find the fastest routes from feature to feature to get coverage. Another dose of coffee. Grab gear. Go. We park and head straight for Mt. 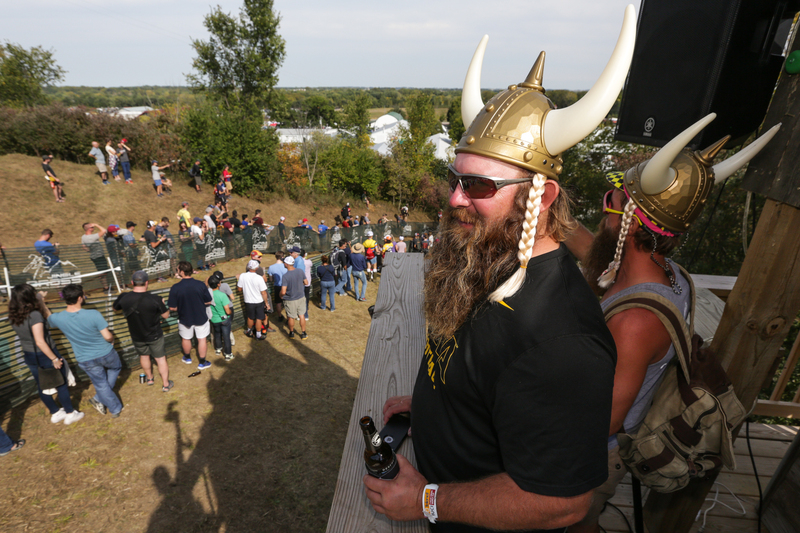 Krumpit, a decisive feature at Jingle Cross. With each step, I dig my toes into the hill and lean hard into the grade. It’s a long slog—one that racers will make at least twice as many times as I will today. After racers head down the drag strip start and roll through some twisty grass sections, they hit a flyover and head straight at the steep, rutted wall, covered by a cloud of dust and noise. Right away, racers must decide to ride or run the 100-meter passage. At some point, racers may not have a choice. 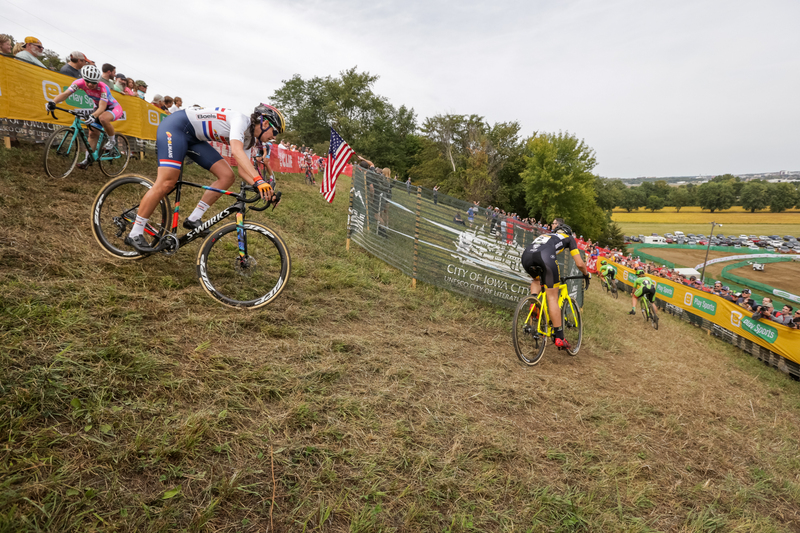 There’s no way for us to catch the start of the women’s race—which is at the bottom of the hill—and make it up Mt. Krumpit in time to see the shakeout. It’s just after 2 p.m. and we can only assume the race has started. The DJ is thumping beats through the crowd in preparation for the racers’ arrival. Announcements from down below can’t penetrate the thick atmosphere of Mt. Krumpit. As the first racers peek around the corner, Cant’s world championship jersey is immediately in view. 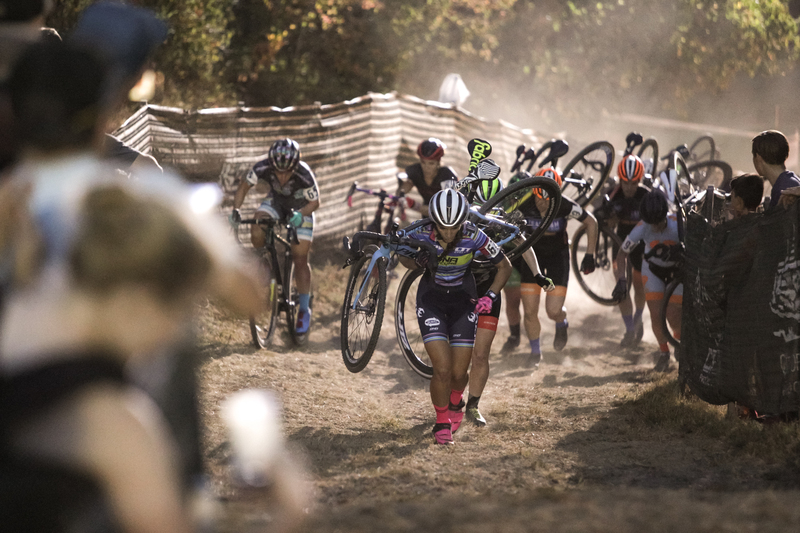 She’s alone at the front, riding up Krumpit while all of her contenders shoulder their bikes in pursuit. As the final riders pass by, the crowd flows over to the sweeping descent off Krumpit. Within a minute, the race has arrived and riders are already spread out. It’s a single-file slalom to the bottom with racers testing the balance between speed and grip through loose, off-camber corners. Cant appears to have paid dearly for her ascent up Krumpit and has slipped back in the pack. 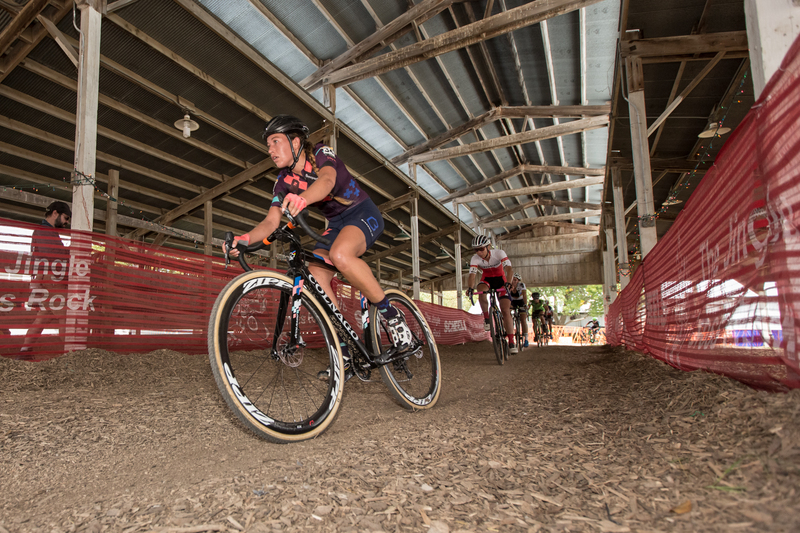 At the bottom, it’s a pure power course again, speeding through the gravel, dirt and grass paths of the Johnson County Fairgrounds. 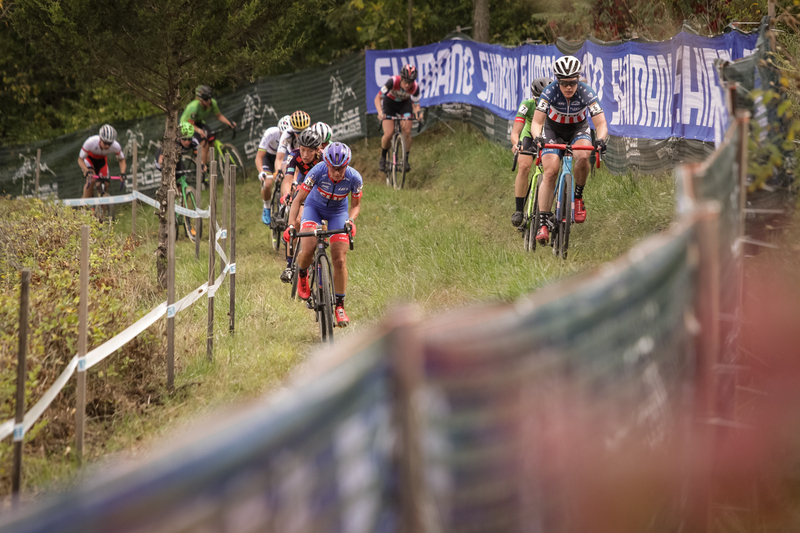 If racers aren’t already pinned from the hard tempo being pushed at the front, they are as they ascend the backside of Krumpit through a twisty wooded path. Down Mt. Krumpit, back to the flats and over the barriers. Then a quick tour of the venue’s barns before another brief push up the low side of Krumpit and a dash to the finish. 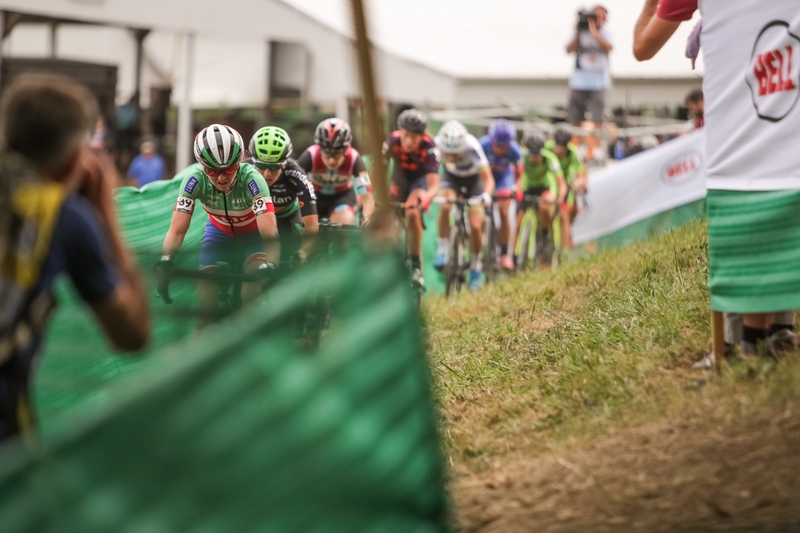 Italian champion Eva Lechner is driving a hard pace with Maud Kaptheijns, Ellen Noble, Sophie de Boer, Cant, Lechner’s teammate Katerina Nash and the Cannondale-Cyclocrossworld.com duo of Kaitie Keough and Emma White just behind. On the next lap, Nash moves to the front and Katie Compton is marking her. Nash is a serious contender for today. 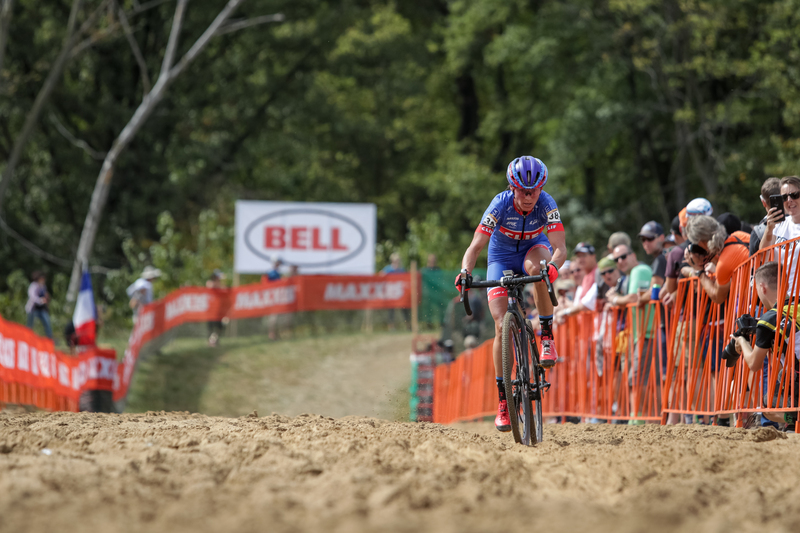 Even though she eased off mountain bike racing in recent years, she still holds the bronze medal from February’s cyclocross world championships. At age 39, she doesn’t look like someone eyeing retirement. She’s here to win. Compton matches Nash on the descent off Krumpit, but goes down in the final corner and lands hard. The pack passes as Compton remounts and heads to the pits. She rolls in slowly, gathers herself and consults with Mark Legg (aka Mr. Katie Compton). Five seconds pass. Ten seconds. It seems like half a lap has passed. She carefully remounts and rolls off. Her podium hopes dashed, but she’ll finish. With Compton off her wheel, Nash makes a move. With every subsequent lap, the gap continues to grow. Behind, the race is getting interesting with riders rotating at the front of the chase. American hopes aren’t dashed, though. Keough remains in the mix. 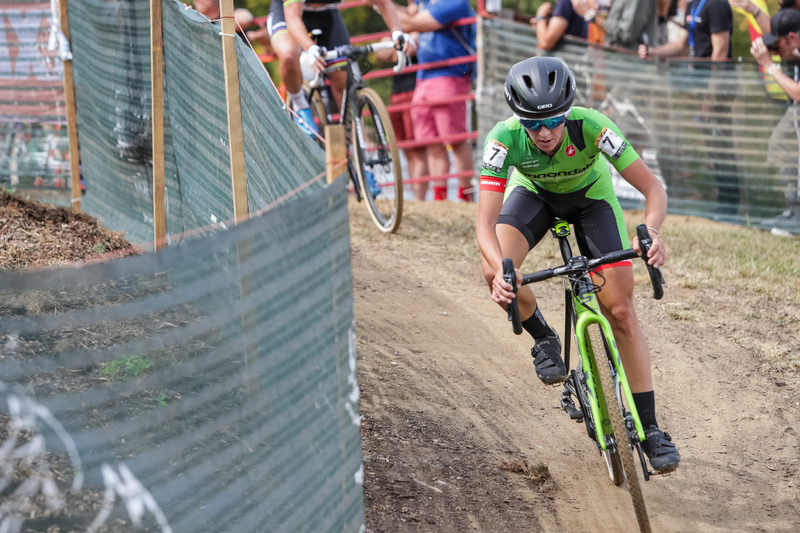 Following a C2 win in Rochester the previous week and a C1 night race victory on Friday, Keough appears to be on her best form ever. Last year, she earned third place on the podium here. Another trip up the steps seems likely, as she clings to Cant, de Boer and the rest of the Euro-heavy field. The final laps tick away and Nash’s win is assured. Her grimace is now more of a grin. 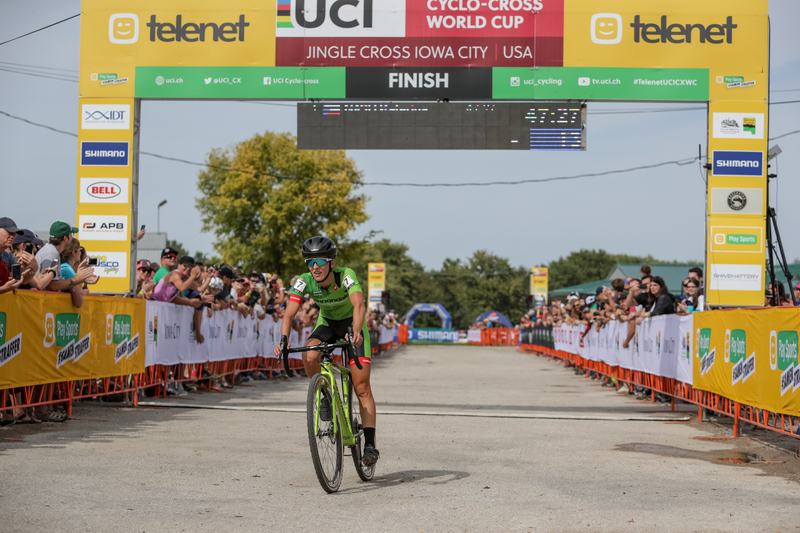 Keough has good legs—her spirits no doubt boosted by the support of fellow Midwesterners in attendance. With two laps to go, she moves to the front and pushes a hard pace up Krumpit. The group is starting to fracture. Up the backside of Krumpit, she gets a bit of a gap and it’s starting to look like the rest are racing for third. I head to the barriers as the race is winding down and arrive just in time to catch the leaders. Noble has lost contact, but I wait a few moments to catch her coming through. 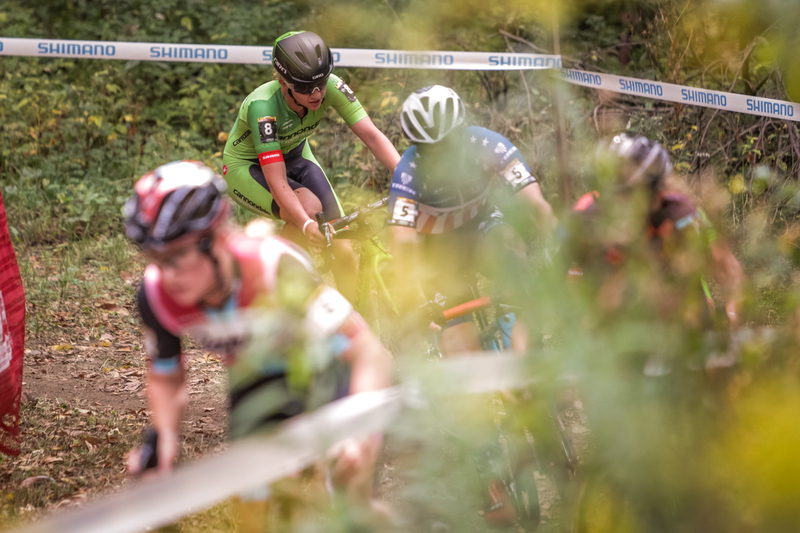 During Friday’s C1 race, she turned heads by riding the barriers—the only woman to do so. After burying herself to stay in the top 10, it was uncertain if she’d pull it off again. She’s here. She’s airborne. 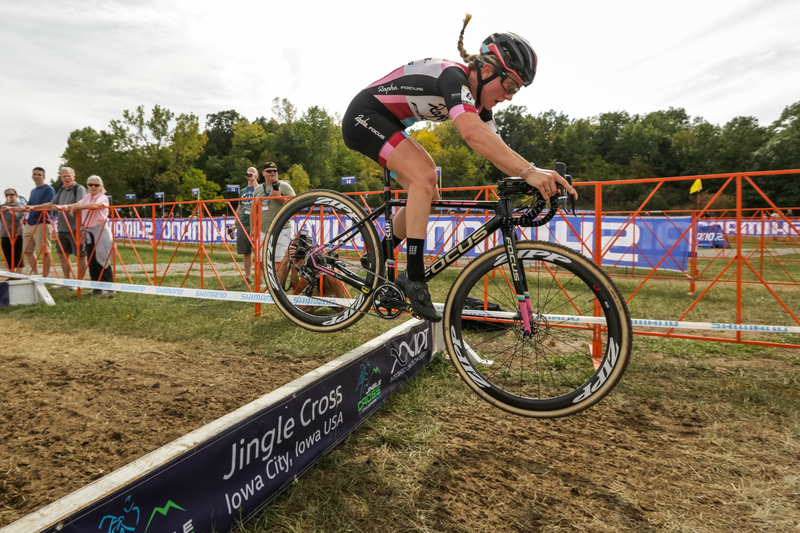 She’s done it—the first woman to bunnyhop barriers in a major UCI race since Pauline Ferrand-Prévot at Superprestige Diegem in 2014. Nash rolls alone through the finishing straight. She has plenty of time to coast down the reception line and thank the fans. She may not race as much as in seasons past, but when she does, she makes it count. The seconds tick by and Keough’s green kit comes into view. She holds her gap and pulls off a huge result, besting Cant and others. Friday night, she showed her strength, beating U.S. champ Katie Compton. We will never know if Keough could have beaten a crash-free Compton today. 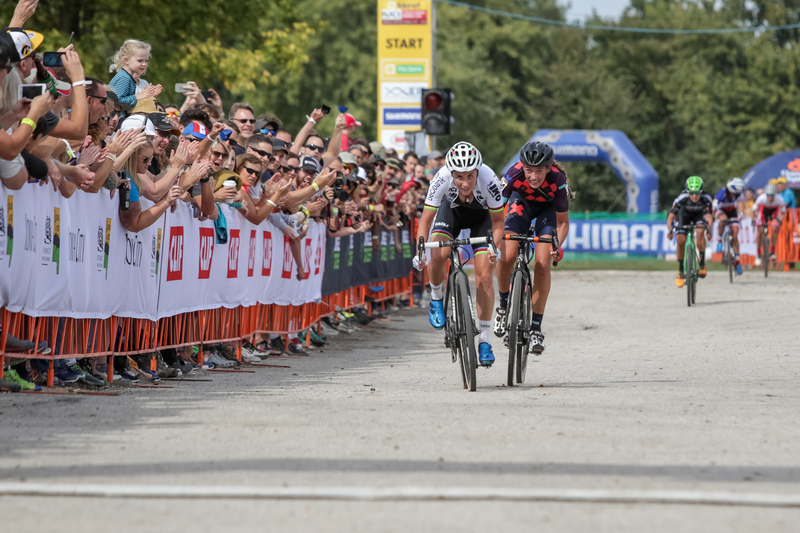 Cant and de Boer sprint shoulder-to-shoulder and the world champ takes it by a bike length. 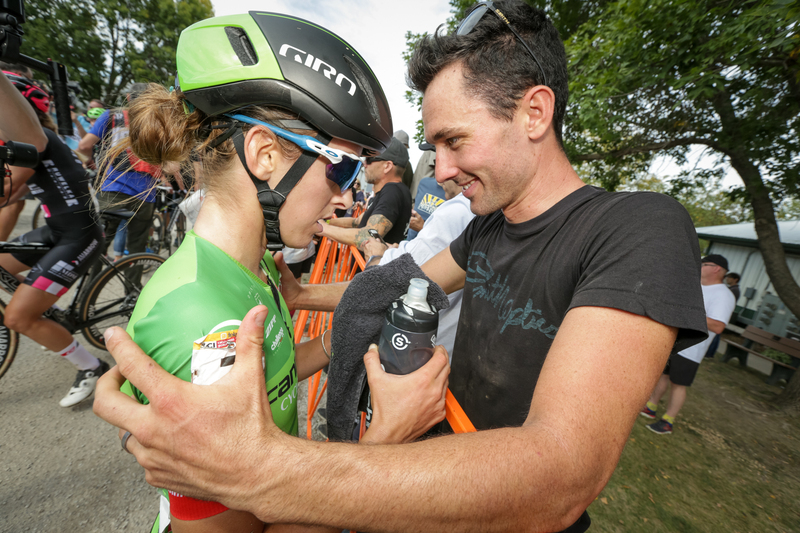 Cant gains an in-race victory, but she won’t don the World Cup leader’s jersey at next week’s round at the Trek factory in Waterloo, Wis.
After a quick dash to the podiums, the photo scrum heads to the start for the men’s introductions. 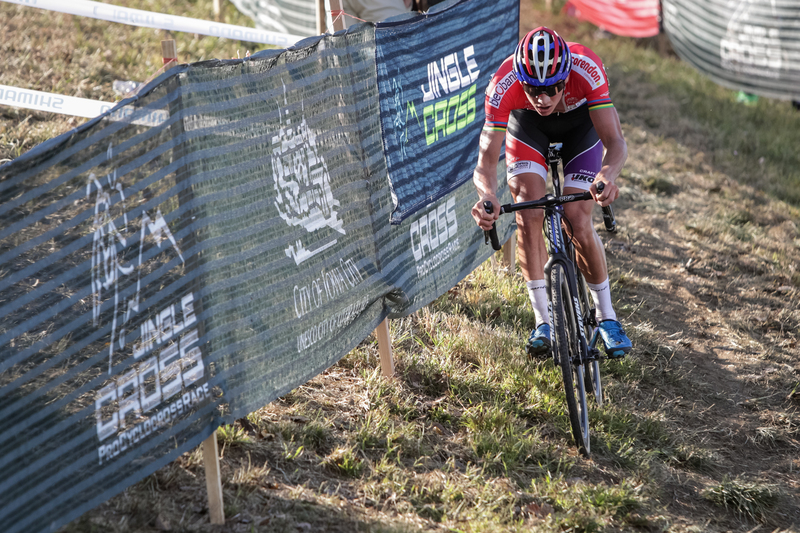 Mathieu van der Poel rolls up to the tape as cool as can be—literally. He’s wearing an ice vest to combat the climbing temperatures in Iowa City. Underneath he’s trying to remain cool as well. 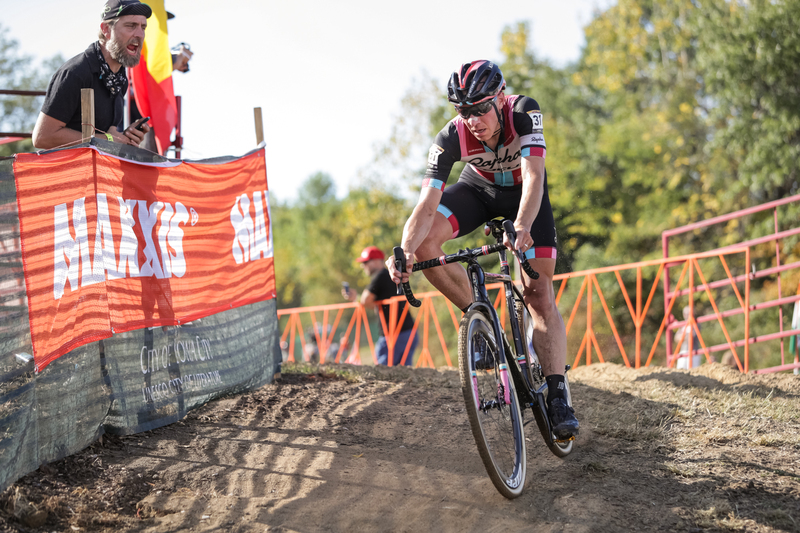 He missed last year’s Jingle Cross due to injury, denying him a clear shot at the World Cup leader’s jersey. Mechanicals doomed his chances at the World Championship. Time to set things right. Stay cool. 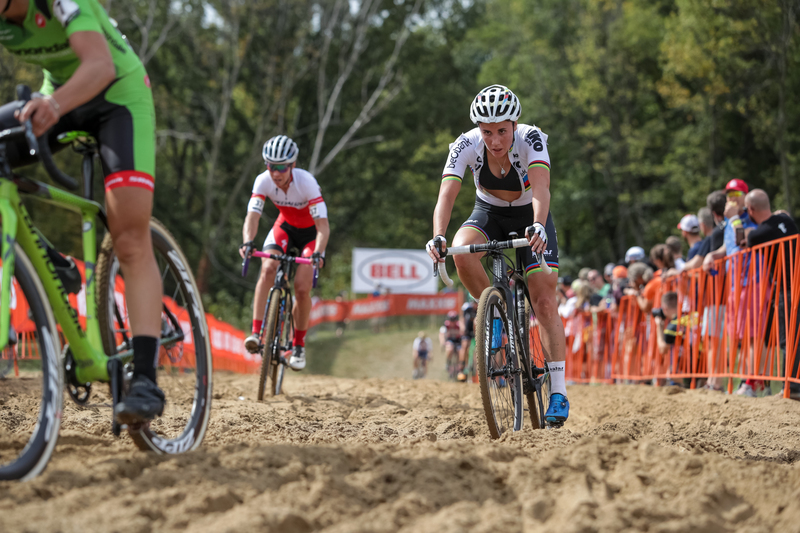 From the gun, Van der Poel assumes the head of the pack and refuses to let it go. Contenders are willing to let him pull. Maybe he’s too anxious, going out too hard. Up Mt. Krumpit he continues to apply the pressure. He pushes hard over the top of the hill and the field is already coming apart. Down to the sand pit and the gap is three seconds. We’re two minutes into the race and it seems the outcome is already determined. 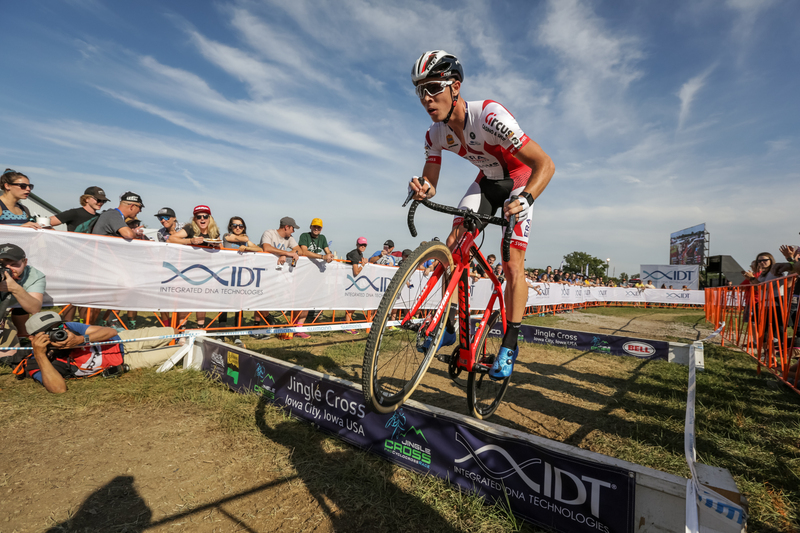 Van der Poel is healthy and on form. 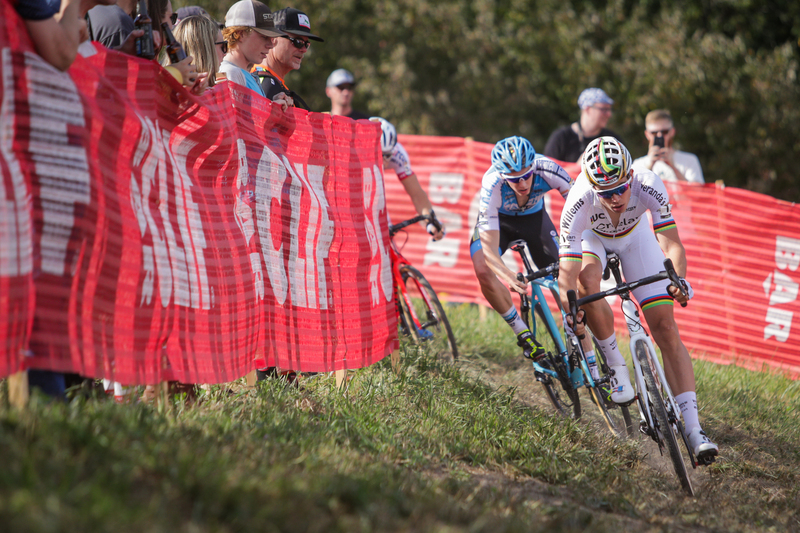 Behind, van Aert is honoring his World Championship jersey by taking up the chase and pulls the pack with him. No one will give van Aert a free ride today. 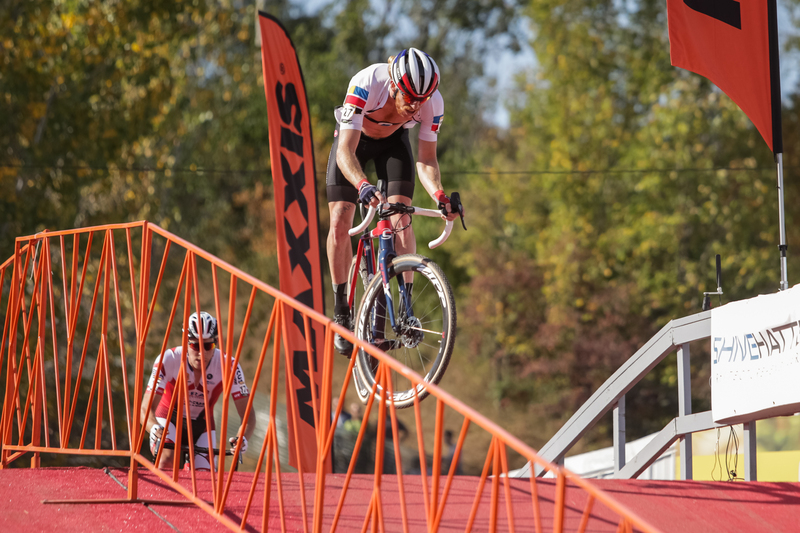 The first time through the finishing arch, the gap to van der Poel is up to 10 seconds. Wout’s efforts help set up Laurens Sweeck to come around and chase on his own. Sweeck knows the course well after winning Friday’s C1 night race. Lap two and Van der Poel has a 17-second gap on Sweeck. The ERA-Circus rider isn’t closing in on first, but he is leaving the rest of the field. Quinten Hermans knows he can match Sweeck, after finishing second to him on Friday. He goes off the front and by lap three, he too is now gapping the rest. A selection is forming: not by tactics, but strength. Van der Poel has proven that power, not in-race politics, will win the day. 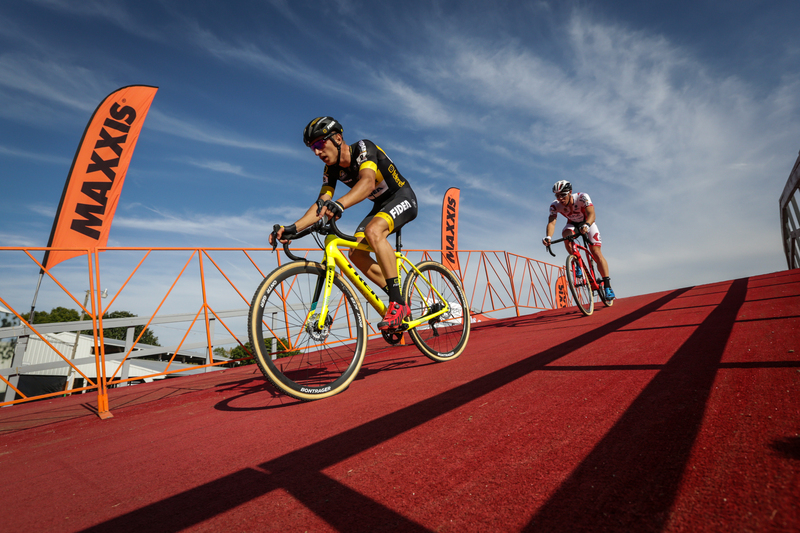 The strongest riders will have to lay it all out there to reach the podium. Hermans reaches Sweeck on the backside of Mt. Krumpit and the two share the effort to hold off the pack. 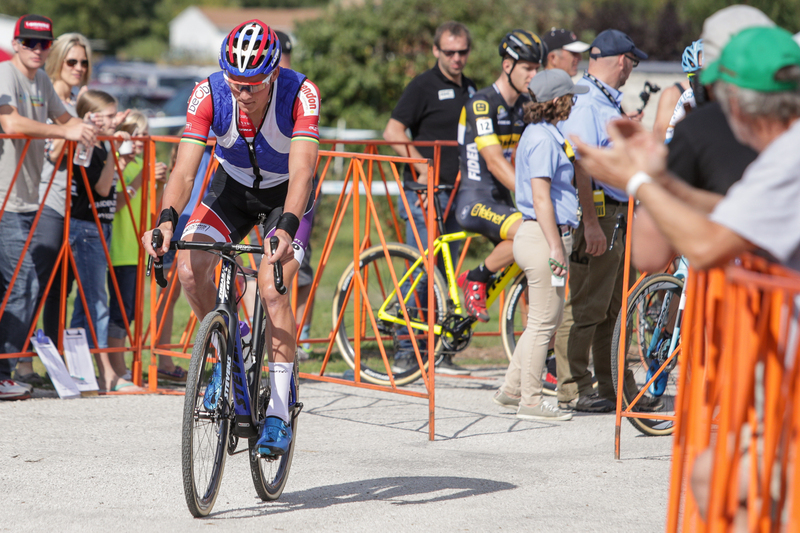 Van der Poel is 23 seconds up the road and only a crash or major mechanical can stop him now. It’s happened in the past. It happened at Worlds in Bieles this past February. Anything is possible. Sweeck and Hermans must chase. As the laps tick away, the gaps continue to grow. Politics is now dooming the hopes of those behind the three leaders. Riders begin to sit up and look around, coaxing each other to work. The gaps balloon. Van der Poel eventually gains 51 seconds on the nearest chasers. It’s more than just power, though. 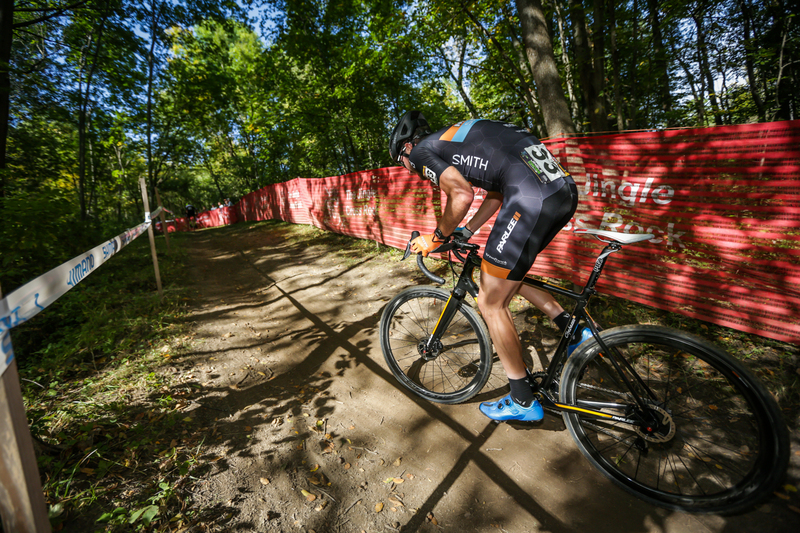 He’s remarkably smooth in the course’s technical sections, flowing effortlessly through the twisty off-camber downhills. 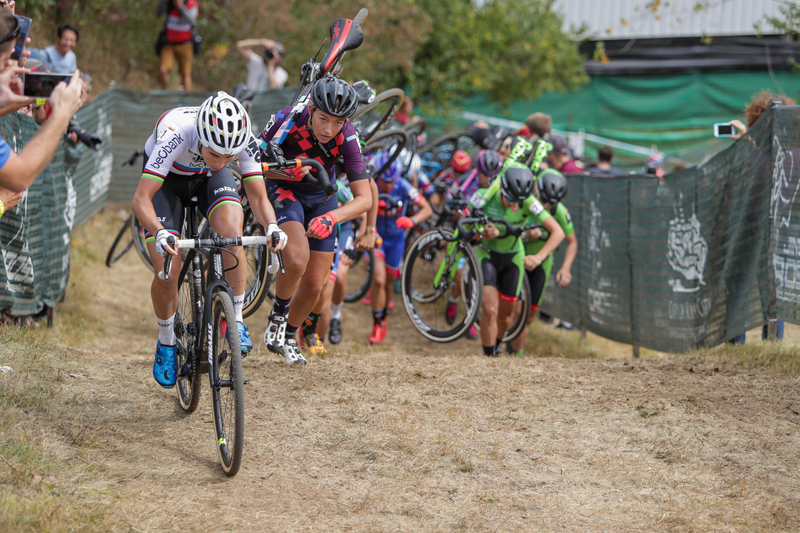 While others visibly brake in corners, Van der Poel seems to never lose momentum. He has everything he needs to win today—and perhaps what he needs to become world champion again. 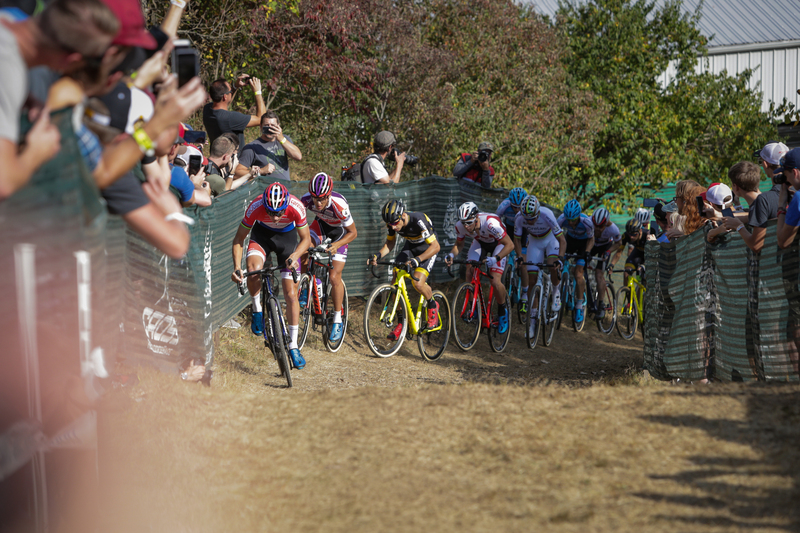 Last lap and Van der Poel reaches the opposite end of the venue as Sweeck and Hermans start their final loop. Behind, Hermans’ teammate, Lars van der Haar, is battling Kevin Pauwels for best of the rest. Van der Haar doesn’t appear to be the de facto leader of the Telenet-Fidea Lions squad, finishing behind the 22-year-old Hermans twice this weekend. While many young riders tend to fade by the end of a full hour of racing, Hermans stays strong. It’s a revelation for the Belgian squad. Team boss Sven Nys knows he has a lot of options available to him this season. But the day belongs to van der Poel. A pump of his fist at the finish punctuates his statement here. He’s back to claim what he lost last season. It seems that only a similar fate of injuries or mechanicals could stop him now. Sweeck out-sprints Hermans to the line, followed 10 seconds later by Pauwels then van der Haar. Van Aert has paid dearly for his efforts today and finishes 14th. A dose of reality for the world champion. It will be a long season and a tough battle to retain the rainbow stripes in February. In the pack, the Americans battled for pride and points. U.S. champ Stephen Hyde stuck near the front of the race early. He finished 10th here last year, so he knows he has a shot. 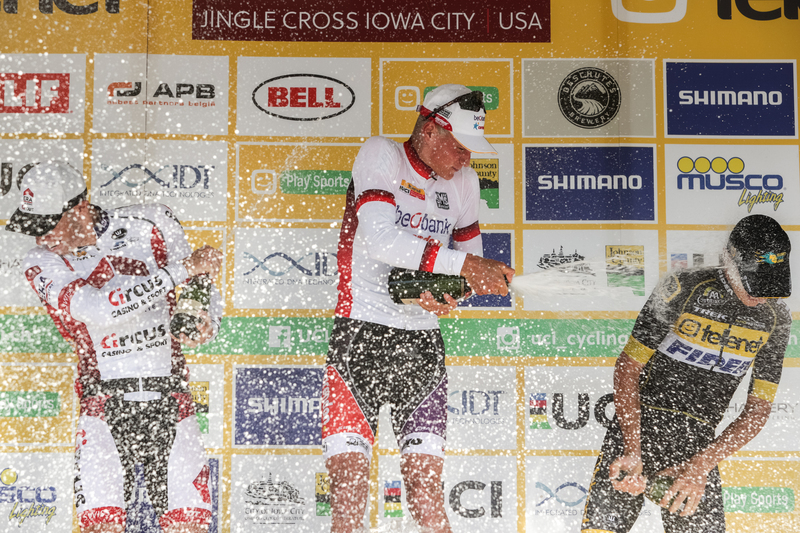 But heat and fatigue took their toll and by mid-race, he went “full Schleck,” racing with his jersey wide open. Kerry Werner cracks the top 20, taking a sprint against Rob Peeters and Matthieu Boulo. Hyde rolls through in 23rd, followed by Jeremy Powers in 27th and Tobin Ortenblad in 28th. Podiums are done and race weekend draws to a close. 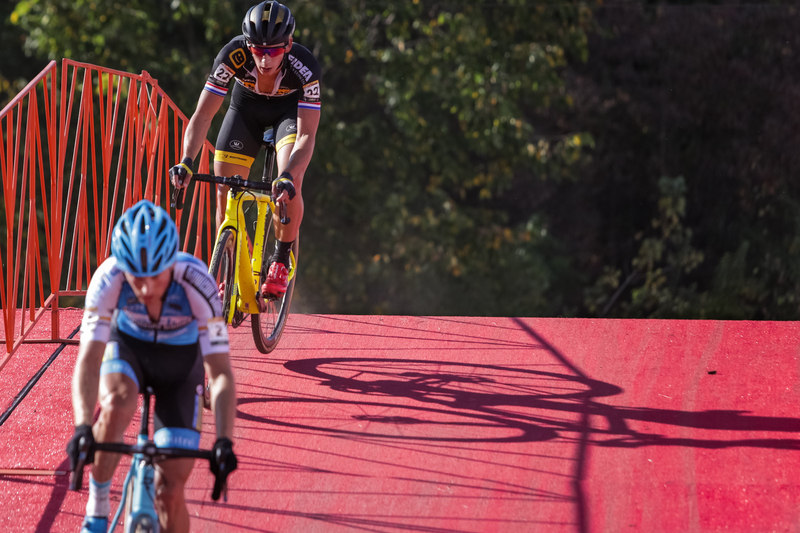 Jingle Cross played the perfect host for the World Cup opener. 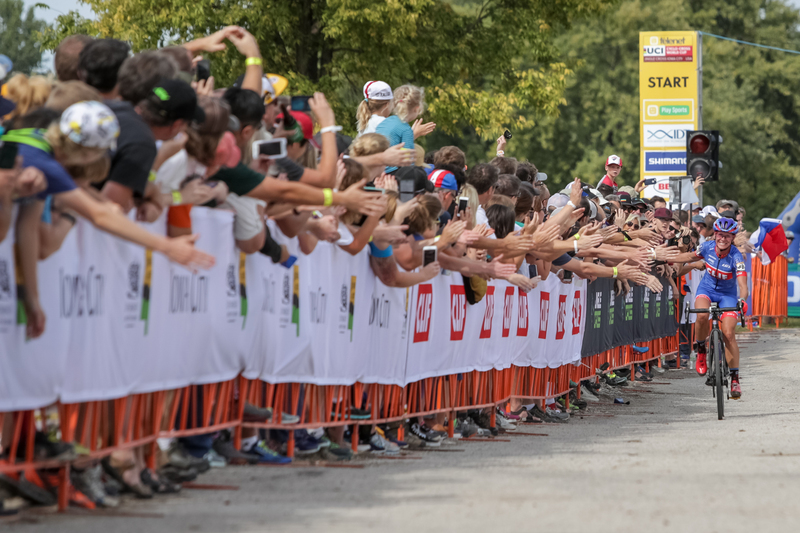 I chat with a European UCI official on the way to the parking lot who tells me about how “cool” and relaxed everything is here in the U.S. scene. It’s a good vibe all around. The harsh sun that shook me awake this morning is now a warm glow on the horizon. But it’s back to reality for us. We’ve got content to push. Grab gear. Go. Thanks Bill and Bruce! Fantastic coverage! Cheers and hope to see you soon! Fantastic photos with content to match. Chapeau!